Released over a year following the second series of The New Counter-Measures and with no immediate plans for any further stories featuring this furtive organisation barring a guest appearance in the upcoming celebratory release The Legacy of Time, Ian Potter’s ‘The Hollow King’ represents the de facto finale of this fascinating range that has so brilliantly brought aits complicated charter to life amidst political and otherworldly pressures. With reports of lights and flying saucers over Swammcombe and a recent rise in psychiatric cases among members of the Open Band, Counter-Measures has begun investigating this strange group and Lord Cavall, the so-called Swami of Swammcombe. Naturally, Sir Toby and Group Captain Gilmore, in particular, believe that Cavall is running something of a scam, using his vast resources and the eternal hope and yearning of people looking for a deeper understanding of self and world to pass on his New Age ideologies. To that effect, Cavall’s upfront nature about profiting off of his new music compositions that will allegedly help followers reach the desired elite state of Visualization draws further consternation, and though the exact reason for these supposed UFO sightings remains unknown, they suspect that Cavall and his vast resources are behind them in some fashion as well. Understandably for an isolated story, not every core character gets the opportunity to step into the spotlight, though each appearance nonetheless perfectly captures the essence of the individuals in this secretive group. Rachel is afforded the opportunity to show off her more scientific side while Gilmore strives to undertake his own investigations and Sir Toby tries to remain abreast of everything related to the subject while showing glimpses of humour he rarely shows, but it’s Allison who provides the emotional hook for the team and audience alike. As the most likely hippie in the group, she is sent to discover first-hand just what being a member of Open Band entails and to try to find out why so many people following this path have been so psychologically affected. It’s through her that the lifestyle and music of this cult are introduced and developed, and what initially seems to be just another group of like-minded individuals being taken advantage of turns into something far more ominous thanks to a brilliant performance from Karen Gledhill and a few well-timed and surprising plot developments. Of course, the success of this story hinges just as much on the characterisation of Lord Cavill at its core, and Tim Bentinck excels as this prominent but also enigmatic figure who enjoys such a profound following. Cavill can be arrogant and conceited, but despite his occasional abrasiveness he does seem to genuinely believe in his methods and what his followers can achieve, and this well-rounded character who is both patently open about his possessions, family, and mantra as well as deliberately surreptitious about certain actions he takes makes for a truly fascinating and complex figure around which to anchor these events. Yet the truth is far more sinister than anyone could have imagined, and Cavill’s personal and familial history past come to forefront in a shockingly grotesque manner that frames everything in a new and satisfying light. 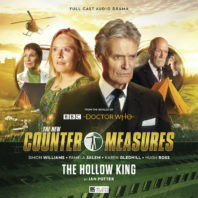 The majority of audio releases under any iteration of the Counter-Measures banner have been via box set, and though ‘The Hollow King’ proves to be a perfectly adept standalone tale that potentially ends this series on a high, it’s a shame that it was not afforded a longer running time or even multiple stories to fully explore this small corner of the world and everything that is occurring within it. It’s a testament to the writer, performers, sound design, and direction that everything flows so seamlessly as such scope is tackled adroitly, but there’s clearly much more nuance to each individual aspect that must by necessity remain unearthed. Nonetheless, this is a perfect example of just how far these characters have come individually and as a group, especially for Sir Toby who was not in ‘Remembrance of the Daleks’ on screen, and it will prove rewarding both for those who have followed this group’s audio adventures from the start and for those with only a passing familiarity or looking for something new.